There were high hopes for the reformist candidate Mir-Hossein Mousavi in Friday’s presidential election, but when the results were announced and Mahmoud Ahmadinejad was declared the winner, the situation looked incredibly suspect. As more officials speak up, it’s clear that the outcome was predetermined and the will of the people disregarded. 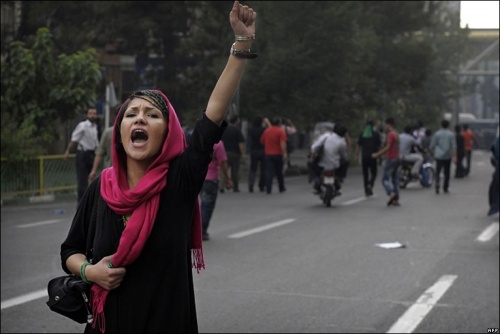 The coup to keep Ahmadinejad in power has been met by an unbelievable uprising of Iran’s youth. Seventy percent of Iran’s population is under age 35, and they’re very interested in freedom and in improved relations with the rest of the world. Watching them publicly demonstrate against those grabbing power and even face violence at the hands of state police the Basij is truly inspiring. It’s too early to say yet how this is going to end – in the crushing of dissent by Ahmadinejad and crew, or in a new regime through revolution. Personally, I don’t see how an illegitimate presidency obtained through fraud and force will be tollerated by the people of Iran. Much already has been, and will be, said about the role of technology (especially Twitter) and the absence of western media (especially cable television) in the aftermath of the Iranian election. With SMS messaging disabled and access to Facebook and other social media sites blocked by the Ahmadinejad regime, mobile Twitter applications became the primary method for getting news out of the country and the for organizing the protests. It’s clear that the opposition has been strengthened by the ability to quickly spread information to others. For example, this nighttime rooftop protest was organized by Iranian Twitter users. As said by Andrew Sullivan, the Revolution will be Twittered. Iran has the 3rd highest population of bloggers in the world, so I don’t think the protesters will go away quietly. As much talk as there is about Twitter and other social media supplanting the likes of CNN in covering breaking news, they’re really another source rather than a replacement—and Twitter users know that as well as anyone else. Thus, they want—and demand—big news organizations to step up, nimbly and responsively, to cover fast-changing events like this. Thankfully, The New York Times, The Huffington Post, and Andrew Sullivan have all been doing awesome coverage on the web.